So what are you going to do now? That was a reasonable question. After all this Mad Hatter had impulsively grabbed a plane that morning to Chicago to surprise two of her compatriots celebrating National Hat Day. Other than tea and a room at the Palmer House Madge’s plans were to say the least a bit sketchy. Well, I’ll find something to do I told my fellow hatters; after all it’s Chicago. Well the ladies tut-tutted that notion. Mary had family obligations and had to return to the ‘burbs, but Iris was game and we worked up a quick plan. 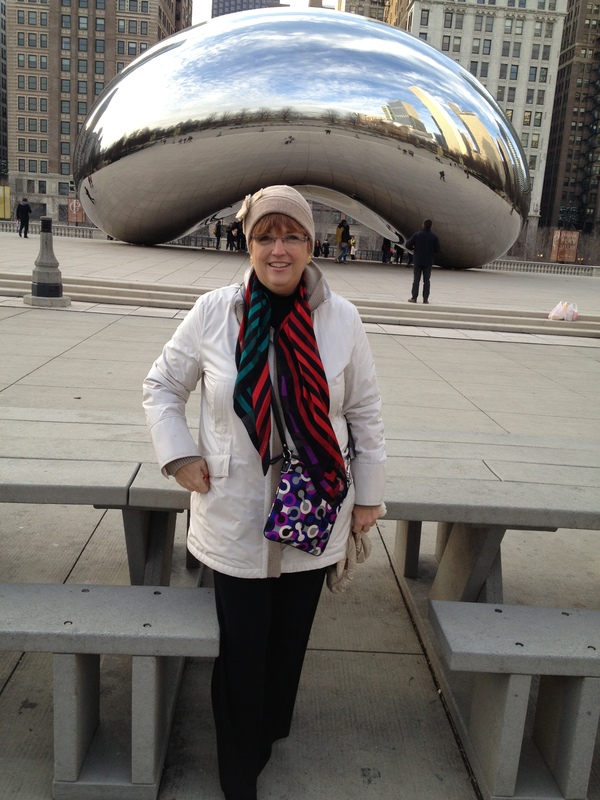 As mentioned in the previous post, Madge had not been to Chicago since the nineties. With a sunny day and Millennium Park just a few blocks away, a walk was in order. A true Chicagoan in the 30˚ weather, Iris wore her luncheon chapeau proudly, but Madge chickened out and brought out a warmer number than the Giles Francois she had worn at tea. The architecture in the park was thrilling. First up was Cloud Gate by British artist Anish Kapoor, his first public outdoor work installed in the United States. Affectionately called ”The Bean” it’s an elliptical sculpture of a seamless stainless steel plates reflecting Chicago’s famous skyline and the clouds above. It’s amazing to see the surrounding buildings reflected in the shiny surface. 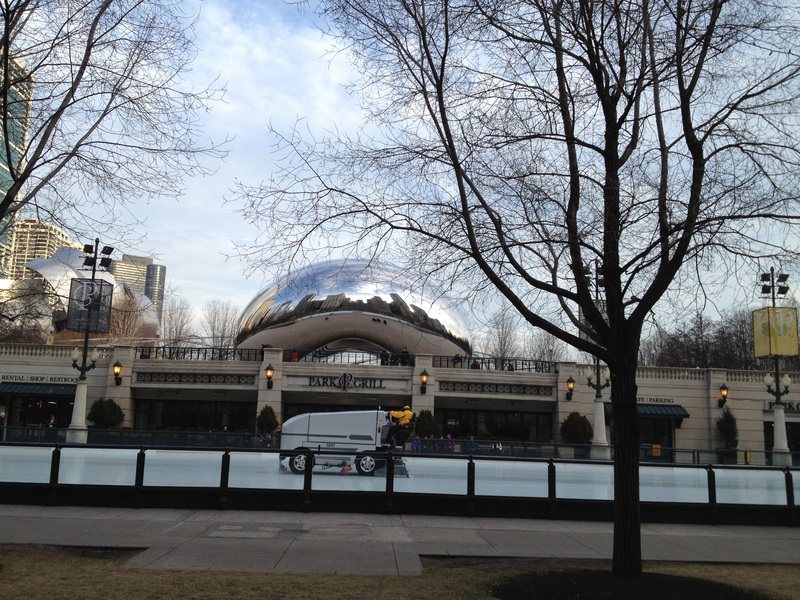 Madge loves the photo she took of Cloud Gate with the zamboni on the ice rink in front. 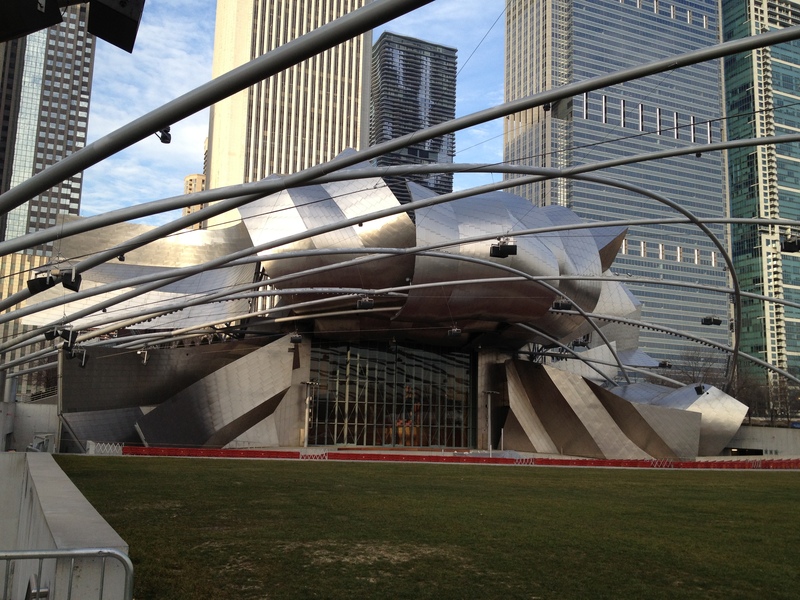 Next up was the Jay Pritzker Pavilion. Designed by Frank Gehry, it’s an outdoor take on his famous Guggenheim Bilbao Museum in Spain, with ribbons of steel across the top. The Pavilion, a large amphitheater must be a wonderful place to take in a concert with all the skyscrapers looking on. Iris and Madge had great fun walking though out the park which was such a unique mixture of historic and modern architecture amidst grassy knolls and surrounded by this great city. Well, with the sun going down and a chill starting to set in. The mini tour was over. After a stop off for some hot chocolate Madge repaired to the hotel with an agreement to meet Iris later for dinner. That night Iris arrived, absolutely fetching in another hat by New York Creations, this time a brown saucer, and it was off to Greek Town. Iris had reserved a charming table at one of her favorites, a restaurant called Santorini named for the famous Greek island. Dinner was a sumptuous feast of appetizers including clams, Greek salad, grilled eggplant, hummus and more, with a copious amount of Santorini Island white wine. 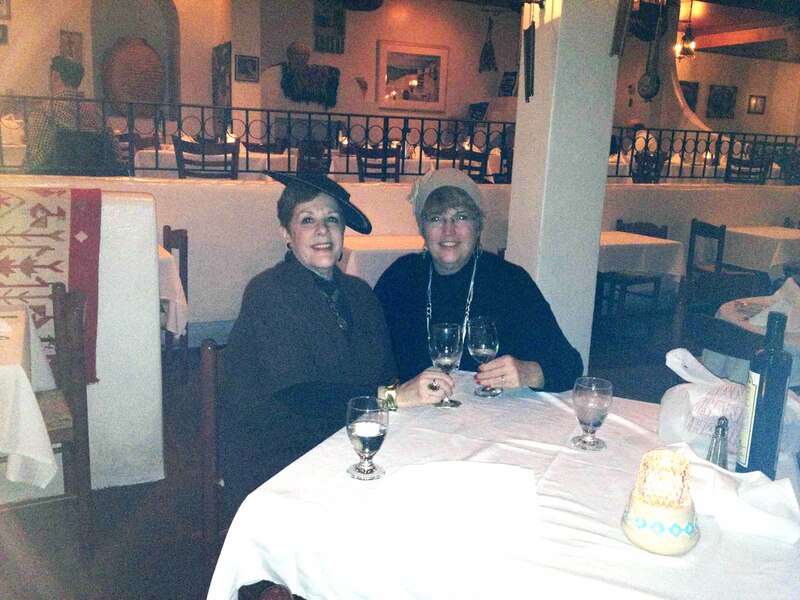 Iris was such a good sport entertaining a perfect stranger and we had a marvelous time at dinner conversing about food, life and hats. 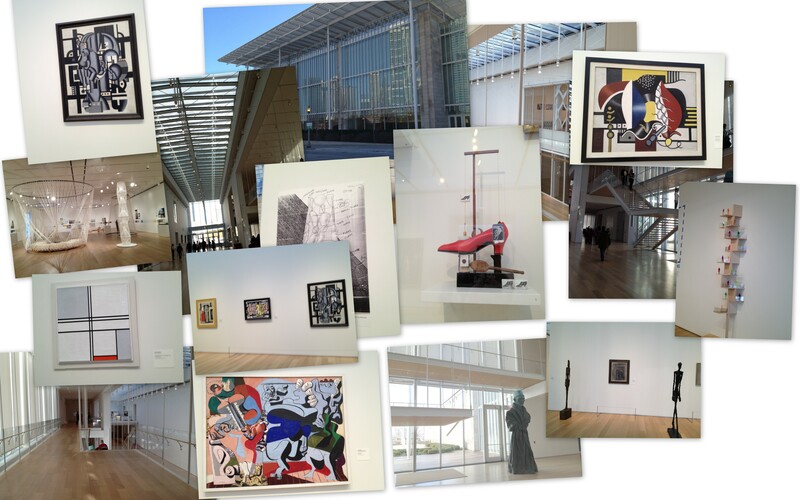 The next morning Madge had a free few hours before the plane back to Atlanta so she decided to check out the new modern wing at the Art Institute of Chicago designed by Renzo Piano. The new wing, while totally modern, connects smoothly over a set of commuter railroad tracks to the original building, a 1893 Beaux Arts beauty. The original section was constructed in conjunction with the World’s Columbian Exposition, May 1, 1893–October 30, 1893, organized to commemorate the 400th anniversary of Columbus’s landfall in the New World. As Madge wandered the galleries, the Piano architectural design became more and more impressive. Piano’s use of natural light through out the galleries really enhanced the viewing the Art Institute’s modern treasures. One particular placement was very haunting. 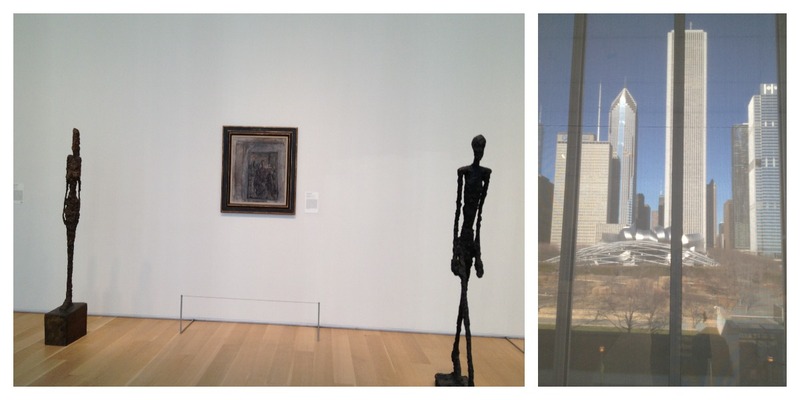 A grouping of stark Alberto Giacometti figures which, if you followed their gaze, looked out to the Chicago skyline view through a set of translucent shades. Well time flew quickly by and after the galleries plus a short shop in the gift shop, Madge had just enough time to pick up her bags and bid adieu to Chicago. You’re so good at spontaneity, Pam. How fun! And a fun report – your narrative style is just as charming as your photographs, vintage treasures, and little ole self. What a grand report this is of your surprise trip to Chicago. Glad you had fun the whole time, and will “for now” consider a return. Give Iris and I a couple days notice and some ideas of what will tempt you next. Then you could get to see the millinery display windows of Eia, Jenny of Forme, and Joy Scott. Created by Ultimate Architect. Copyright © 2019 Madges Hatbox Vintage.